Crook Hall built in the 13th century is one of the oldest inhabited houses in Durham. The Hall is a jumble of buildings reflecting its historical development. A medieval Hall merges into a Jacobean section with an attached Georgian house. The house is surrounded by 6 acres of romantic gardens laid out in a series of rooms such as the Shakespeare Garden, the Cathedral Garden and the Secret Walled Garden. Durham's bustling market place is a short walk away and many who view the gardens describe it as a 'peaceful oasis'. A fact that possibly led William Wordsworth and John Ruskin to visit the gardens for quiet contemplation! The 13th century Grade I listed Medieval hall provides a spectacular backdrop to the stunning gardens. Visitors from all over the world come to share in the timeless magic of Crook Hall and leave inspired by these idyllic English gardens. Soak up the atmosphere over a home-made cream tea in the pretty courtyard or in front of a log fire in the Georgian dining room. The gardens are just a short walk from the city's bustling market place. Country Life described the Hall as having "history, romance and beauty", and its just waiting to capture your heart. 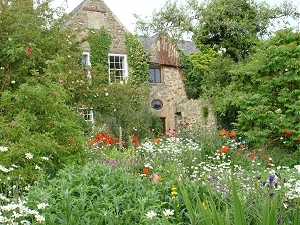 Crook Hall is on Frankland Lane, Sidegate, a short walk from Durham City's The Gates Shopping Centre. Just follow the road next to the river from the Riverside and The Gates Car Parks, opposite the Gala Theatre.